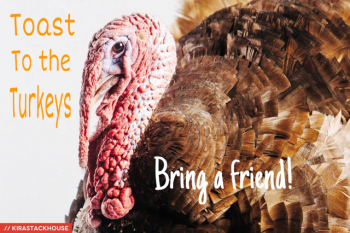 This year, in celebration of Toast to the Turkeys, we would like to reach out to individuals who either don’t know about the work that Harvest Home does, or are new to the idea of veganism or farmed animal rescue. Do you have a friend who you think would benefit from being exposed to Harvest Home’s work, our incredible rescued animals, or our amazing vegan meals? If so, purchase two tickets to Toast to the Turkey 2015–one for you and one for your guest– and both of you will get a special gift at the event! Don’t delay–early bird ticket prices end on October 23!